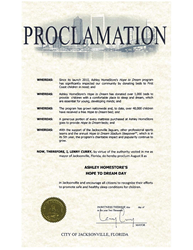 During the 2016 Ashley HomeStore - Hope to Dream Stadium Sleepover at EverBank Field, Mayor Lenny Curry issued a proclamation for the program’s impact on the Jacksonville community, declaring August 8th, ASHLEY HOMESTORE’S HOPE TO DREAM DAY. While we are committed to changing lives through Hope to Dream every day, we want HOPE TO DREAM DAY – to make an exponential difference in the lives of local children. That is why we do what we do – to make a difference. During the 2016 Ashley HomeStore - Hope to Dream Stadium Sleepover at EverBank Field, Mayor Lenny Curry issued a proclamation for the program’s impact on the Jacksonville community, declaring August 8th, ASHLEY HOMESTORE’S HOPE TO DREAM DAY. To celebrate its first official Hope to Dream Day, Ashley HomeStore is giving away an additional 200 beds to 200 kids in need this week – a record number for one week here on the First Coast, and just in time for Back to School. In recognition of being the number one Tempur-Pedic® retailer in the country, a vast majority of the beds being donated this year are Tempur-Pedic® mattresses. Since the program’s beginning in Jacksonville almost seven years ago, Ashley HomeStore has given nearly 50,000 free beds to underserved children across the country. “To put that in perspective, that is almost 1,000 school buses of kids, and we intend to continue to grow that number significantly” said Caprio. The 200 free bed recipients were all eligible for Ashley HomeStore’s Hope to Dream program, which funds the free beds directly from proceeds of mattress sales in its showrooms. Many of the recipients were recommended from local, child serving organizations, including Tom Coughlin’s Jay Fund, Children’s Home Society, Hubbard House, the Salvation Army and Safe Harbor in Brunswick, GA. Continuing their partnership with the Jacksonville Jaguars, Ashley HomeStore will culminate the week’s festivities with a Hope to Dream bed delivery to a family in partnership with the Jaguars, the Roar and Jaxson De Ville. Several other NFL teams have joined in on the momentum by holding their own Stadium Sleepovers with Ashley HomeStores in their respective NFL cities this year, including the Dallas Cowboys, with more in development for the 2018-2019 season. A portion of the proceeds from every mattress purchase at local Ashley HomeStores benefits local children in need. Families in need of beds for children ages 3-16 should complete nomination forms in any local Ashley HomeStore showroom or online at http://www.ahopetodream.com. Ashley HomeStore is the #1 furniture and mattress retailer in America and the #1 selling furniture store brand in the World. Ashley HomeStore is also the #1 Tempur-Pedic Retailer in America. Ashley HomeStore has four locations in the Jacksonville, Florida area (St. Johns Town Center, River City Marketplace, Orange Park @ I-295, and at Glynn Isles Market (Brunswick GA)). The retailer is an exclusive provider of furniture from Ashley Furniture Industries, Inc., the largest furniture manufacturer in North America. For more information on Ashley HomeStore and our products, visit our website at http://www.AshleyHomeStore.com. If you would like further information, photography/video, or to set up on or off-camera interviews please contact Tori Fusinaz at tfusinaz@ashleyjax.com or at 904-217-7367.